Home The three kiss-offs I’ll be glad when the midterm elections are done so we can talk about Ebola without bouncing between defending incompetence and exploiting fear. If you spend too much time on social media, you might get whipsawed between two opposing narratives about Ebola in the United States. On the one hand, you’re being told that your risk of catching Ebola is quite high and that (no-title) Obama is only telling you otherwise to cover up the incompetence of his administration. On the other hand, you hear respected scientists saying that your chances of catching Ebola are quite low, while Democrats accuse Republicans like Senator Rand Paul of whipping up hysterical fear just before the mid-term elections. If you’re not paying attention to these factional disputes, you can walk right into an argument you didn’t know you were part of. I did this on Facebook when I posted this cartoon during the period after the two nurses in Dallas had contracted Ebola, but had not yet recovered. don’t you guys ever stop trying to justify or minimize the mistakes of the obama administration. i just figured at one point you would get tired or something. they let ebola into the US. would they let someone from a MEASLES infested country in too. if they would maybe we need new people in charge. This was when I realized that all the pronouncements about the science of Ebola transmission and all the statistical evidence about the risk of catching Ebola were actually counterproductive. The more the President and people in his administration spoke about science and statistics, the more people just heard CYA for all the mistakes and waffling of the CDC. When others made the same points with no thought of partisan politics, they were heard as just being shills for the administration. Or, and this is even more common, they came across as condescending elitists. I’ve had some experience at the receiving end of this kind of preaching. Some of Laura’s friends urged her to look into complementary or alternative medicine for her brain cancer. Laura would smile wanly, or just nod and hide behind her aphasia. One of her closest friends with the same mindset as Laura recommended R. Barker Bausell’s book Snake Oil Science: The Truth about Complementary and Alternative Medicine. Since it has sections on my practices of qigong, taiji and acupuncture, I started to read it, but couldn’t get past the first few chapters. It’s rather hard to continue very long when you’re being treated as an idiot, fool, or charlatan. Perhaps I was mistaken in assuming that Bausell wants to communicate with people who practice or are at least open to complementary or alternative medicine. He comes on so strongly he may just be preaching to the choir. If he was trying to communicate with those who do not agree with him, he compounded the mistake of his sneering tone by his superficial understanding of how modern science works. His concept of cause-and-effect ignores the philosophy of science from Bacon to Popper. This self-described research methodologist writes as if he had never heard of the null hypothesis. The CDC, other scientists, and other medical professionals want to communicate with people who are so afraid of Ebola that they think their loved ones might get Ebola just by flying into Dallas-Fort Worth twice a week, or who would bar a child from school in Connecticut just because she went to a family wedding in Nigeria, which has no cases of Ebola, but is in West Africa, or who fire their cleaning woman because her brother works in a restaurant from which quarantined news people bought take out. These experts lost credibility because of their mistakes and because they were wrong when they told us that the American medical system was ready for any Ebola cases it might encounter. If you add to that the suspicion that their exhortations to listen to science and statistics are really just excuses for an incompetent administration, it is not surprising that these scientists and medical professionals completely lose their audience when they come across like Bausell. I’m not guiltless here. My mistake in posting that cartoon was worse than talking down. 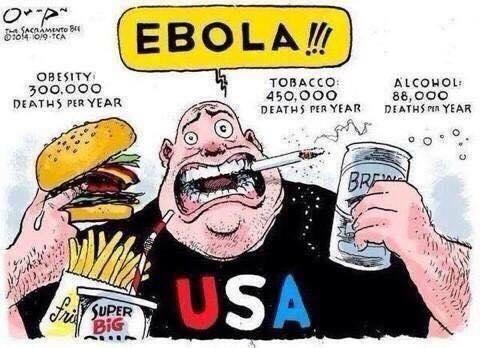 The cartoon mocks Americans for being more afraid of Ebola than other diseases more likely to kill them. That’s Bausell’s style of argument. The CDC and other medical professionals may not openly deride Ebola fears the way that cartoon does, but over and over again in various ways they talk as if those fears would just disappear if people only listened to them. Dr. Daniel J. Diekema, president of the Society for Healthcare Epidemiology of America, identifies how this works (or actually doesn’t work). Try as they might, however, even when scientists, experts, and pundits address the fears of their audience, they tend to dismiss or belittle fear. They talk or write as if people would not be afraid of Ebola if only they knew more. … officials are up against the inherently emotional and instinctive nature of risk-perception psychology. … the perception of risk is not simply a matter of the facts, but more a matter of how those facts feel. US health leaders are communicating reasonably well. Constant, honest, humble risk communication is a vital part of establishing trust, which is especially crucial for managing public concern during crises. When mistakes are made, they admit them. When new developments happen …they report them. While perhaps sounding too confident as they claim they can keep Ebola from becoming a public epidemic, they are avoiding un-keepable promises of absolute safety, acknowledging that there may well be more sporadic cases. Some experts talk as if people’s fears would go away if only there did not exist a widespread distrust of science and expertise associated with things like climate change, evolution, and vaccination. In general, scientists, experts, and pundits convey very clearly, even those who avoid saying it outright, that they think that their audience should not be afraid. The implied judgment that fear is wrong and the implied directive not to be afraid come across loud and clear, however much they try to project understanding of this fear. Their explanations, generally aimed at other scientists, experts, and pundits, tend more to explain away people’s fear than to acknowledge how fear works for us. Conversations about fear of Ebola need to begin with the simple, uncritical acknowledgment: We are all afraid of Ebola. Followed by: Ebola kills a lot of people in horrible ways. We are not acknowledging fear or recognizing the reasons for being afraid if we immediately belittle these reasons or launch into an argument that you wouldn’t be afraid if only you knew better. I could give my FB friend all the statistical arguments in the world about how unlikely it is that her husband will catch Ebola because he goes through DFW airport twice a week. She’s afraid because she can imagine what would happen to her husband and her family if he gets Ebola, not because she’s done a statistical computation of combined probabilities. Ebola certainly fills the bill as an evil that is destructive and painful. How imminent Ebola is to each of us is the question, but we’ll never get into a good discussion of that question if we don’t acknowledge how clearly we see its pain and destructiveness. If we start by minimizing how likely (“imminent”) it is to become sick with Ebola, we sound as if we’re minimizing its capacity for pain and destruction. And, by the way, as if we’re trying to minimize how badly this epidemic has been handled by the very organizations that should have handled it: the World Health Organization and the Centers for Disease Control. Ropeik and others mention the work of Daniel Kahnemann in their effort to pigeonhole Ebola fear as “psychologically normal.” They also need to reflect on how Kahneman applies to their own narrative of science vs. fear, and to their confidence in Science. At a very personal level, I discussed the question of the chemical reality of the noxious smells that bothered Laura in our laundry room. I did not want Laura to be disturbed by those smells. I may have argued with her about where those smells were coming from, but I never denied that she smelled something unpleasant. Today, I don’t want my FB friend to fear for the safety of her husband, but I won’t be of any help if I start by denying what is very clear for anyone to see: Ebola causes a horrible death. That’s exactly what I’m doing if I don’t address the image of this painful, destructive evil and start the discussion by minimizing its likelihood. I don’t want people to stigmatize, ostracize, or harass health care workers who have treated Ebola patients. I want to prevent the automatic association of people from West Africa with risk of Ebola. To begin that discussion I need to acknowledge the images of pain and destruction carried by the news media from the center of the epidemic. Previously we have discussed how just specific signs of hostile forces can create this aura of the power to destroy or harm us: Laura’s visual cut, the flat tire, Jop’s arrest, the whalers’ line. With Ebola, we are not hearing or seeing scientific abstractions. We watch television images of the dead and dying in West Africa. We see the same pictures on the internet. They come at us through social media. The power of these images is such that David Brooks tells us it is “scarier to follow an event on TV than it is to actually be there covering it.” The media may be new, but it works as Aristotle explained to make the danger very particular as to person, form, and time. With these clear images of the pain and destruction caused by Ebola before us, let’s go back to the question of just how imminent that pain and destruction is, both with respect to exposure and survival. In line with my emphasis on recognizing the particular judgments encompassed within fear, these reflections are going to be more personal than scientific. In West Africa, 70 percent of people with Ebola are dying, while seven of the first eight Ebola patients treated in the United States have walked out of the hospital in good health. Only one died: Thomas Eric Duncan, a Liberian, whose treatment was delayed when a Dallas hospital initially misdiagnosed his illness. Somehow these better odds don’t make me feel better. But my feelings have nothing to do with Ebola. They have more to do with how the medical professionals communicated with Laura about her odds of surviving her grade 4 brain cancer, glioblastoma multiforme. I have previously told the story of how Laura started crying when she heard the oncologist say that their first course of treatment only had a 50/50 chance of even having an impact on the tumor. Even if she hadn’t been crying, as a non-statistician she probably would not have caught the full import of his next statement to the effect that of those on whom the treatment had an impact, only 25% survived. And he never mentioned how long they survived. In a survey after Laura’s death, one of the cancer support groups who had worked with us and with Anne Mei sent a survey about our experience. In answer to the question of what could have been done better, I said: someone could have told us that GBM is a death sentence. One of the reasons I get down on the so-called power of positive thinking is that the odds of surviving GBM are one-tenth the odds of surviving Ebola. Only 3 out of 100 survive GBM, even with treatment, versus 30 out of 100 surviving Ebola, even in the poor conditions of West Africa. 50% of GBM patients are dead within one year. But all the medical experts who are telling us now to listen to science kept quiet when it was time to tell Laura that her chances were much worse than 50/50. They were only 3 out of 100. GBM may take longer to kill you than Ebola, but it is much more deadly. And that extra time is often just more time to suffer agonies that can be as bad as what happens to an Ebola patient. As much as we would not have wanted to hear these statistics, if we had been told the real outlook at the time of her diagnosis, we might not have changed her treatment, but we would have had to have the conversations about the future without her that we couldn’t have once her aphasia worsened. My point is that the medical experts can be very selective when they want to share the full statistical story with us and when they don’t. Another personal reflection concerns the odds of contracting Ebola. Without quibbling about where they became infected, we can say that the incidence of Ebola in the United States has been 8 people out of a population of 313 million. The incidence of GBM is much higher. There are about 18,000 cases of GBM in the United States at present. You can see the high mortality rate in the fact that there are about 11,000 new cases each year. Not only is the risk of GBM much higher than the risk of getting Ebola, scientists really have no idea how we get GBM whereas they are certain that we get Ebola only from contact with the bodily fluids of an infected person. Even if the virus mutates to become airborne, the method of transmission will be known. Not so with GBM. I’m not heading in the direction of the kind of argument that my cartoon and NPR made. In fact, I’m more afraid of catching Ebola than I am of getting GBM. Strangely, I’m not afraid because there’s nothing I can do to avoid GBM. I’m not afraid because I cannot imagine how I might get GBM, but I can imagine contact with the bodily fluids of an Ebola patient. Obviously, I feel some anger about GBM. Fear and anger are both addictive. Both arise from a lack or loss of power/control. Feeling fear or anger helps us feel as if we’re doing something about a situation over which we have no control. Then, we like the rush of self-importantly, urgently responding to evil. We have seen Walter Cannon’s analysis of the “visceral changes” involved with these “emotional disturbances” where hormones and nerves increase blood flow and the circulation of “energy-giving sugar.” These physiological reactions may not be as strong in the kind of “existential fear” that David Brooks describes, but they occur nonetheless. Like the fight-or-flight response in the face of a physical attack, the visceral changes even of “existential fear” can be amplified by activity. We cry when we are sad about something bad that has happened. Paradoxically, crying feels good. The occasions for fear and anger are also bad, but their visceral changes, the increase or even surge of adrenaline and sugar, feel good. We need to be aware of when we are going back for more sugar and adrenaline. Even if those in authority (legal or scientific) aren’t listening to our feelings, we need to listen to them. We need to listen to ourselves. Listening doesn’t mean being consumed by fear or anger. Listening requires more than merely hearing the sounds (i.e., the bodily sensations) . Listening requires more than awareness of the sounds and their source; listening requires self-awareness that we are other than the sounds, that these sounds have no meaning in themselves. We give our fears their meaning, just as I use my anger to feel I’m doing something about what happened six years ago. …I want to change the narrative about my daughter. She’s not a girl who was sent home because she had Ebola. This is a girl who was wrongly sent home because of irrational fear, ignorance and overreaction. Whether we listen to the experts or not, we can listen to this father’s pain.